It is really sad that Africa is such a turbulent place, because it is breaming with beauty. "Virunga" is documentary that explores the intense world of Congo. As the film opens we briefly touch up on the somber history of the country before delving into its current situation. The country of Congo is in the transition of a political and economic shift when the documentary opens. There is a rebellion led by a group called M23 that wants to overthrow the old government. In the midst of this chaos there is a sanctuary called Virunga National Park. Within the confines of this park, live the last group of mountain gorillas in the Congo. The personnel of this park are dedicated to protecting these remaining mountain gorillas from all threats, whether they are poachers or the rebels or huge companies trying to capitalize on the possible oil hidden under the terrain of the park. The documentary explores the stories of four different people. 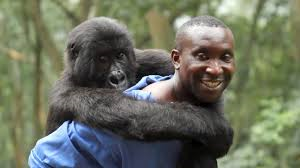 First, we learn about the gorilla carer Andre Bauma, who exhibits great knowledge of the gorillas and reminds us why it is so precious to protect them. We also meet head park ranger Rodrigue Mugaruka Katembo and watch how difficult protecting a park can be. We meet chief warden of Virunga Emmanuel de Moerode who also protects the park. Finally, we also meet French journalist Melaine Gouby as she dives into the politics of the civil war raging in Congo and why the possible oil is so important and who exactly it is important to. We learn that there maybe some sort of alliance between M23 and SOCO a major company interested in the oil and which complicates matters for the national park. Not only does this park guarantee the safety of the last remaining mountain gorillas, the revenue of tourism helps the economy of the country. Which is why the park is sacred to the rangers and personnel working at the national park. The works as a somewhat thrilling look into the bitter economics and politics of a country under siege of rebellion and social change. The rivalries that Gouby uncovers would have made the film nominated for Best Documentary all by itself, and it is quite riveting how things in the movie shake out. I also loved how easy it was sympathize with the gorilla personnel and rangers who are so desperately trying to protect life there. There is also a rich beauty to how director Orlando von Einsiedel captures the beauty of the country itself, the cinematography lush and the imagery surreal. Overall, "Virunga" is a visually and emotionally stunning journey. It is vastly engaging on a variety of levels. There are tender moments as well as moments of great tension. There is scene near the end of the movie, lasting a good ten minutes, when the M23 rebels get very close to closing in on the national park and the way the scene is shot and edited is breath-taking. The year 2014 was a solid year for documentaries and it will be interesting to see how this one does in the race on Sunday.